All Quick-To-Train Try this first. The app will train all the model types available for your data set that are typically fast to fit. All Linear Try this if you expect linear boundaries between the classes in your data. This option fits only Linear SVM and Linear Discriminant. All Use this to train all available model types. Trains every type regardless of any prior trained models. Can be time-consuming. If you want to explore classifiers one at a time, or you already know what classifier type you want, you can select individual models or train a group of the same type. 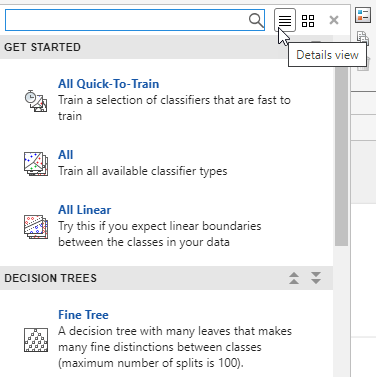 To see all available classifier options, on the Classification Learner tab, click the arrow on the far right of the Model Type section to expand the list of classifiers. The options in the Model Type gallery are preset starting points with different settings, suitable for a range of different classification problems. For help choosing the best classifier type for your problem, see the table showing typical characteristics of different supervised learning algorithms. Use the table as a guide for your final choice of algorithms. Decide on the tradeoff you want in speed, memory usage, flexibility, and interpretability. 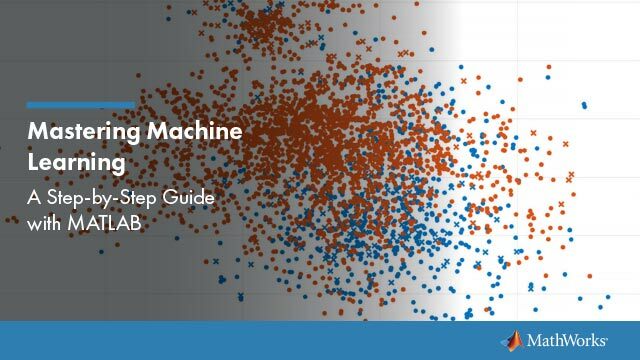 The best classifier type depends on your data. To avoid overfitting, look for a model of lower flexibility that provides sufficient accuracy. For example, look for simple models such as decision trees and discriminants that are fast and easy to interpret. If the models are not accurate enough predicting the response, choose other classifiers with higher flexibility, such as ensembles. To control flexibility, see the details for each classifier type. Supports C code generation for prediction. Slow for others Medium for linear. These tables provide a general guide. Your results depend on your data and the speed of your machine. To read a description of each classifier in Classification Learner, switch to the details view. After you choose a classifier type (e.g., decision trees), try training using each of the classifiers. The options in the Model Type gallery are starting points with different settings. Try them all to see which option produces the best model with your data. For workflow instructions, see Train Classification Models in Classification Learner App. In Classification Learner, the Model Type gallery only shows classifier types that support your selected data. Decision trees are easy to interpret, fast for fitting and prediction, and low on memory usage, but they can have low predictive accuracy. Try to grow simpler trees to prevent overfitting. Control the depth with the Maximum number of splits setting. Model flexibility increases with the Maximum number of splits setting. Few leaves to make coarse distinctions between classes (maximum number of splits is 4). Medium number of leaves for finer distinctions between classes (maximum number of splits is 20). Many leaves to make many fine distinctions between classes (maximum number of splits is 100). 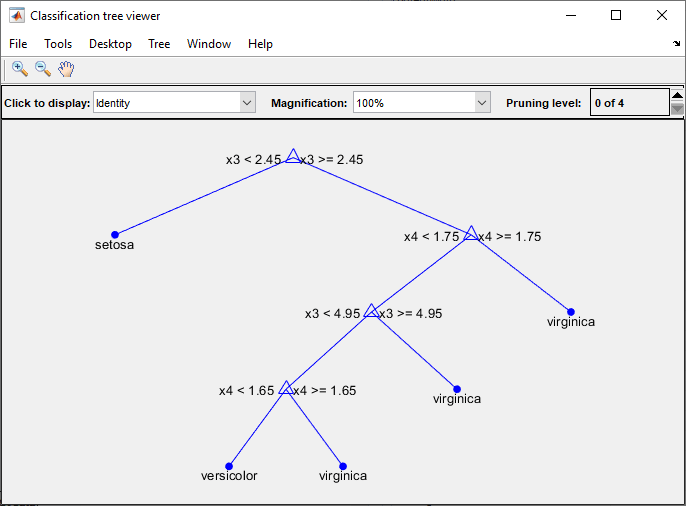 In the Model Type gallery click All Trees to try each of the decision tree options . Train them all to see which settings produce the best model with your data. Select the best model in the History list. To try to improve your model, try feature selection, and then try changing some advanced options. This tree predicts classifications based on two predictors, x1 and x2. To predict, start at the top node. At each decision, check the values of the predictors to decide which branch to follow. When the branches reach a leaf node, the data is classified either as type 0 or 1. The figure shows an example fine tree trained with the fisheriris data. For an example, see Train Decision Trees Using Classification Learner App. Specify the maximum number of splits or branch points to control the depth of your tree. When you grow a decision tree, consider its simplicity and predictive power. To change the number of splits, click the buttons or enter a positive integer value in the Maximum number of splits box. A fine tree with many leaves is usually highly accurate on the training data. 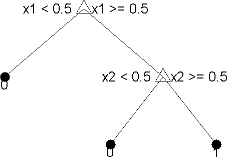 However, the tree might not show comparable accuracy on an independent test set. A leafy tree tends to overtrain, and its validation accuracy is often far lower than its training (or resubstitution) accuracy. In contrast, a coarse tree does not attain high training accuracy. But a coarse tree can be more robust in that its training accuracy can approach that of a representative test set. Also, a coarse tree is easy to interpret. Specify the split criterion measure for deciding when to split nodes. Try each of the three settings to see if they improve the model with your data. Split criterion options are Gini's diversity index, Twoing rule, or Maximum deviance reduction (also known as cross entropy). The classification tree tries to optimize to pure nodes containing only one class. Gini's diversity index (the default) and the deviance criterion measure node impurity. The twoing rule is a different measure for deciding how to split a node, where maximizing the twoing rule expression increases node purity. For details of these split criteria, see ClassificationTree Definitions. Surrogate decision splits — Only for missing data. Specify surrogate use for decision splits. If you have data with missing values, use surrogate splits to improve the accuracy of predictions. When you set Surrogate decision splits to On, the classification tree finds at most 10 surrogate splits at each branch node. To change the number, click the buttons or enter a positive integer value in the Maximum surrogates per node box. When you set Surrogate decision splits to Find All, the classification tree finds all surrogate splits at each branch node. The Find All setting can use considerable time and memory. Discriminant analysis is a popular first classification algorithm to try because it is fast, accurate and easy to interpret. Discriminant analysis is good for wide datasets. Discriminant analysis assumes that different classes generate data based on different Gaussian distributions. To train a classifier, the fitting function estimates the parameters of a Gaussian distribution for each class. Creates linear boundaries between classes. Creates nonlinear boundaries between classes (ellipse, parabola or hyperbola). Discriminant analysis in Classification Learner uses the fitcdiscr function. For both linear and quadratic discriminants, you can change the Covariance structure option. If you have predictors with zero variance or if any of the covariance matrices of your predictors are singular, training can fail using the default, Full covariance structure. If training fails, select the Diagonal covariance structure instead. If you have 2 classes, logistic regression is a popular simple classification algorithm to try because it is easy to interpret. The classifier models the class probabilities as a function of the linear combination of predictors. You cannot change any parameters to control model flexibility. Logistic regression in Classification Learner uses the fitglm function. You cannot set any options for this classifier in the app. In Classification Learner, you can train SVMs when your data has two or more classes. After you train an SVM model, you can generate C code for prediction. Requires MATLAB® Coder™. See Generate C Code for Prediction. Makes a simple linear separation between classes. Hard High — decreases with kernel scale setting. Makes finely detailed distinctions between classes, with kernel scale set to sqrt(P)/4. Medium distinctions, with kernel scale set to sqrt(P). Makes coarse distinctions between classes, with kernel scale set to sqrt(P)*4, where P is the number of predictors. Try training each of the support vector machine options in the Model Type gallery. Train them all to see which settings produce the best model with your data. Select the best model in the History list. To try to improve your model, try feature selection, and then try changing some advanced options. An SVM classifies data by finding the best hyperplane that separates data points of one class from those of the other class. 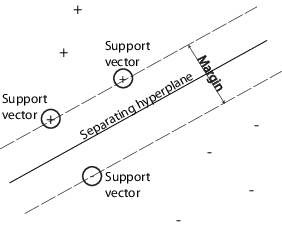 The best hyperplane for an SVM means the one with the largest margin between the two classes. Margin means the maximal width of the slab parallel to the hyperplane that has no interior data points. SVMs can also use a soft margin, meaning a hyperplane that separates many, but not all data points. 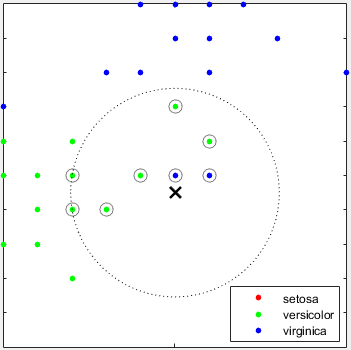 For an example, see Train Support Vector Machines Using Classification Learner App. If you have exactly two classes, Classification Learner uses the fitcsvm function to train the classifier. If you have more than two classes, the app uses the fitcecoc function to reduce the multiclass classification problem to a set of binary classification subproblems, with one SVM learner for each subproblem. To examine the code for the binary and multiclass classifier types, you can generate code from your trained classifiers in the app. Specify the Kernel function to compute the classifier. Specify the box constraint to keep the allowable values of the Lagrange multipliers in a box, a bounded region. To tune your SVM classifier, try increasing the box constraint level. Click the buttons or enter a positive scalar value in the Box constraint level box. Increasing the box constraint level can decrease the number of support vectors, but also can increase training time. The Box Constraint parameter is the soft-margin penalty known as C in the primal equations, and is a hard “box” constraint in the dual equations. Specify manual kernel scaling if desired. When you set Kernel scale mode to Auto, then the software uses a heuristic procedure to select the scale value. The heuristic procedure uses subsampling. Therefore, to reproduce results, set a random number seed using rng before training the classifier. When you set Kernel scale mode to Manual, you can specify a value. Click the buttons or enter a positive scalar value in the Manual kernel scale box. The software divides all elements of the predictor matrix by the value of the kernel scale. Then, the software applies the appropriate kernel norm to compute the Gram matrix. Model flexibility decreases with the kernel scale setting. Only for data with 3 or more classes. This method reduces the multiclass classification problem to a set of binary classification subproblems, with one SVM learner for each subproblem. One-vs-One trains one learner for each pair of classes. It learns to distinguish one class from the other. One-vs-All trains one learner for each class. It learns to distinguish one class from all others. Specify whether to scale each coordinate distance. If predictors have widely different scales, standardizing can improve the fit. Nearest neighbor classifiers typically have good predictive accuracy in low dimensions, but might not in high dimensions. They have high memory usage, and are not easy to interpret. Model flexibility decreases with the Number of neighbors setting. Finely detailed distinctions between classes. The number of neighbors is set to 1. Medium distinctions between classes. The number of neighbors is set to 10. Coarse distinctions between classes. The number of neighbors is set to 100. Medium Medium Hard Medium distinctions between classes, using a Cosine distance metric. The number of neighbors is set to 10. Slow Medium Hard Medium distinctions between classes, using a cubic distance metric. The number of neighbors is set to 10. Medium Medium Hard Medium distinctions between classes, using a distance weight. The number of neighbors is set to 10. Try training each of the nearest neighbor options in the Model Type gallery. Train them all to see which settings produce the best model with your data. Select the best model in the History list. To try to improve your model, try feature selection, and then (optionally) try changing some advanced options. What is k-Nearest Neighbor classification? Categorizing query points based on their distance to points (or neighbors) in a training dataset can be a simple yet effective way of classifying new points. You can use various metrics to determine the distance. Given a set X of n points and a distance function, k-nearest neighbor (kNN) search lets you find the k closest points in X to a query point or set of points. kNN-based algorithms are widely used as benchmark machine learning rules. For an example, see Train Nearest Neighbor Classifiers Using Classification Learner App. Specify the number of nearest neighbors to find for classifying each point when predicting. Specify a fine (low number) or coarse classifier (high number) by changing the number of neighbors. For example, a fine KNN uses one neighbor, and a coarse KNN uses 100. Many neighbors can be time consuming to fit. You can use various metrics to determine the distance to points. For definitions, see the class ClassificationKNN. Specify the distance weighting function. You can choose Equal (no weights), Inverse (weight is 1/distance), or Squared Inverse (weight is 1/distance2). Ensemble classifiers meld results from many weak learners into one high-quality ensemble model. Qualities depend on the choice of algorithm. Model flexibility increases with the Number of learners setting. All ensemble classifiers tend to be slow to fit because they often need many learners. Medium to high — increases with Number of learners or Maximum number of splits setting. High — increases with Number of learners setting. Medium — increases with Number of learners setting. Medium — increases with Number of learners or Maximum number of splits setting. GentleBoost or LogitBoost — not available in the Model Type gallery. Choose Boosted Trees and change to GentleBoost method. Bagged trees use Breiman's 'random forest' algorithm. For reference, see Breiman, L. Random Forests. Machine Learning 45, pp. 5–32, 2001. Try bagged trees first. Boosted trees can usually do better but might require searching many parameter values, which is time-consuming. Try training each of the ensemble classifier options in the Model Type gallery. Train them all to see which settings produce the best model with your data. Select the best model in the History list. To try to improve your model, try feature selection, PCA, and then (optionally) try changing some advanced options. For boosting ensemble methods, you can get fine detail with either deeper trees or larger numbers of shallow trees. As with single tree classifiers, deep trees can cause overfitting. You need to experiment to choose the best tree depth for the trees in the ensemble, in order to trade-off data fit with tree complexity. Use the Number of learners and Maximum number of splits settings. For an example, see Train Ensemble Classifiers Using Classification Learner App. For help choosing Ensemble method and Learner type, see the Ensemble table. Try the presets first. For boosting ensemble methods, specify the maximum number of splits or branch points to control the depth of your tree learners. Many branches tend to overfit, and simpler trees can be more robust and easy to interpret. Experiment to choose the best tree depth for the trees in the ensemble. Try changing the number of learners to see if you can improve the model. Many learners can produce high accuracy, but can be time consuming to fit. Start with a few dozen learners, and then inspect the performance. An ensemble with good predictive power can need a few hundred learners. Specify the learning rate for shrinkage. If you set the learning rate to less than 1, the ensemble requires more learning iterations but often achieves better accuracy. 0.1 is a popular choice. For subspace ensembles, specify the number of predictors to sample in each learner. The app chooses a random subset of the predictors for each learner. The subsets chosen by different learners are independent. Naive Bayes classifiers are easy to interpret and useful for multiclass classification. The naive Bayes algorithm leverages Bayes theorem and makes the assumption that predictors are conditionally independent, given the class. Use these classifiers if this independence assumption is valid for predictors in your data. However, the algorithm still appears to work well when the independence assumption is not valid. For kernel naive Bayes classifiers, you can control the kernel smoother type with the Kernel Type setting, and control the kernel smoothing density support with the Support setting. You can change settings for Kernel Type and Support to control how the classifier models predictor distributions. Naive Bayes in Classification Learner uses the fitcnb function. Kernel Type — Specify the kernel smoother type. Try setting each of these options to see if they improve the model with your data. Kernel type options are Gaussian, Box, Epanechnikov, or Triangle. Support — Specify the kernel smoothing density support. Try setting each of these options to see if they improve the model with your data. Support options are Unbounded (all real values) or Positive (all positive real values). For next steps training models, see Train Classification Models in Classification Learner App.